Whether you're about to graduate, a few years out of college, or seeking an internship to gain sales experience, ADP provides amazing opportunities to jump-start your career! Each Sales Rep (title: SBS District Manager) receives an iPad, base salary, unlimited commission, and multiple incentive trips/year (Monte Carlo, Rome, Hawaii to name a few), a Top-Ranked Training Program and career advancement from your very 1st year! Join one of ADP's Divisional Vice Presidents for a live webinar about great sales opportunities on March 10 at 3PM EST. It will be an exciting discussion on Human Capital Management and how our cloud based SaaS solution has led to 5 years of double digit growth! Join and propel your sales career to the cutting edge. This webinar is for exclusive openings across the United States. ADP will train you. ADP will support you. ADP will reward you. Are you ready to learn how? Join the Webinar on Feb 25th @ 2pm EST to hear how you can build your career foundation at ADP in Outside Sales. Learn why ADP was nationally recognized for training and creates world renowned sales associates. Join our Divisional Vice President for a live webinar about great sales opportunities in Northern California on 12/4 at 12PM PST . This Webinar is for exclusive openings in Northern California. Unlock you career potential! Join us for this live webcast event to hear recruiters and Sales Professionals speak about their roles and our career opportunities at ADP. See ADP's emerging technologies simplify how people do business. You can be a part of developing, delivering and supporting that innovation. Go to jobs.adp.com/careers/technology-jobs for more information and to apply. ADP associates share how their ideas and skills come to life and deliver innovative solutions and tools to help our clients grow their business. Check out jobs.adp.com/careers/technology to learn more and apply. Here first-hand what it's like to be a Client Service professional at ADP. Experience a 'day in the life of' an Inside Sales professional at ADP. Ed gets out of the cold and shares Major Accounts Inside Sales. See if this is the opportunity for you. For more, visit jobs.adp.com/careers/inside-sales-jobs. Do you have a current Life/Health License? Do you also have Customer Service experience with an Insurance Broker/Agency or Carrier, or as a General Agent? If so, then we’d like to meet you!! One of the fastest growing divisions at ADP, Insurance Services is expanding in El Paso and we are looking for people to grow with us. Register below to join our webcast to learn about career opportunities with ADP Insurance Services. Step into 'a day in the life' discussion with Executives, Client Managers and a Recruiter; get answers to your questions about a career at ADP. ADP’s National Service Centers are HIRING! Join us to talk to Hiring Managers about Client Service Consultant Careers. We are currently hiring SEO Specialists and Account Advocates, both with experience in Project Management, Page Optimization, and Keyword Analysis in Detroit. We are growing in Pittsburgh and Parsippany/Florham Park to support business expansion. Please register to join us to learn more about these careers from Executives, an Account Manager in the role, and get tips and questions answered by a Recruiter. ADP NAS COS is hiring more than 100 people Nationwide! Please join us for a conversation with Senior Executives about the business, career paths and what it's like to work with us. We even have a recruiter to answer your questions on benefits, training and creative ways to help get your foot in the door. ADP National Accounts Comprehensive Outsourcing Services provides end-to-end Payroll and HR Outsourcing Services including Pre-employment Services, Workforce and Benefits administration and Talent Management solutions. To support our growth, NAS COS is currently hiring more than 100 HR, Payroll, Benefits and HRIS positions from the most senior-level to entry-level nationwide as well as virtual/home office locations. This is unusual opportunity - we hope you'll join us! We know you. You want to work with smart, talented people in a fun and engaging work environment, where new challenges await you every day. Cobalt has spent the last 15 years doing just that. We work in one of the key industries in America, helping automotive dealers and manufacturers utilize digital marketing media to maximize their retailing effectiveness and profit. We’re passionate about what we do, just like you. Inspiring Innovation is a core value at ADP and at Cobalt, we are committed to delivering it – for our clients and colleagues around the world. Whether it’s the latest in digital marketing or designing a mobile app, the best in operating platforms or the most secure systems – technology plays a critical role in ADP’s growth. It’s the foundation of the products and services that have made us a world-wide leader in workforce solutions. With us, you combine your technical skills with business acumen, to effectively consult as well as solve technical challenges. You have the opportunity to train on leading-edge technologies that continually redefine what’s possible in our industry. ADP is ranked in the Top 50 on IDG’s Computerworld list of the 100 Best Places to Work in Information Technology (IT). 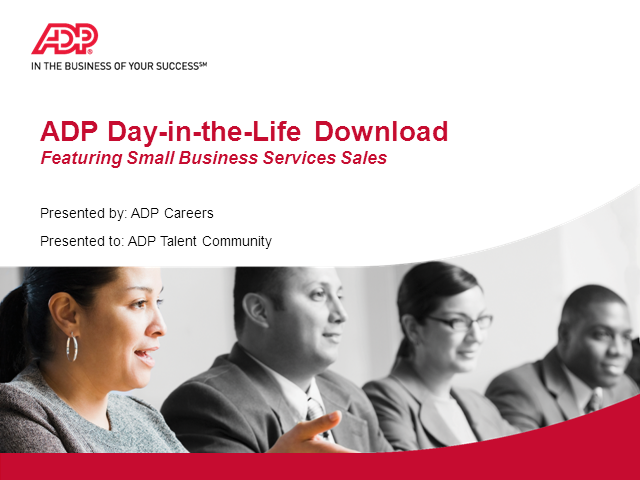 Join us for a 30 minute Day-in-the-Life Download - a snapshot of Careers at ADP. Whether your background is technology, project management, HR, benefits or payroll,there are a variety of Implementation Careers here at ADP! ADP Associates share "day-in-the-life downloads" on open positions, career and job search advice. If you're interested in a Career with ADP, or just seeing what's out there, sign up to see the latest! You can also use the "SHARE" button to share with friends..